When you are creating a user, you can choose which accounts, reports, and application functions that they will have access to. The user permissions will only apply to the user you are creating or modifying. 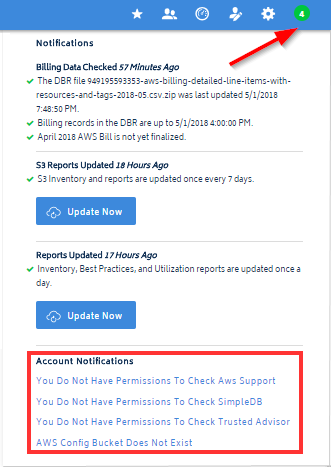 In this topic, we are using an AWS account as an example. To select the user permissions for another cloud provider, click the corresponding tab. Select the check box next to the user permission that you want the user to have access to. See the table for details. This column allows you to identify if you want the user to have access to one account or multiple accounts. This column allows you to identify if you want the user to have access to the cost reports. You must select the All check box or the check box for an individual account in the Access column for a user to have access to the cost reports. If you selected any options in the Cost Reports column, you must choose one of the cost types: blended, unblended, or list. If the customer can see blended or unblended costs, they will be able to see any cost modification due to cost configurations in the partner tools in comparison to what was billed to the reseller/managed service partners (MSPs). Trending reports are located in the Inventory module. Change Monitoring reports are located in the Security module. Click the Notification icon in the header menu to open the fly-out menu with notifications. Partner tools are located in the Cost module. This column is only relevant if you enabled the user to have access to the Cost reports. The API is not bound by user permissions. All data is available via the API.